SEARCH NEW AND EXCITING DOMAINS THIS YEAR ON YOUR HUNT FOR SPRING… and please let us know when you find it! Regardless of how long winter intends to linger, FINELINE SETTINGS is blossoming with excitement now that we can finally share with you our newest addition to the TINY TEMPTATIONS collection! This tiny quartet is colossally cool; and with the introduction of our brand new domains, you’ll wonder how you ever entertained without them! With the arrival of warm weather, blossoming flowers, and budding inspiration, Fineline knew it was the perfect time to bring to you this selection of new products! We love to shake up your concepts of what you can do with our servingware, so don't think these little trays are a one-trick pony! From Desserts displayin', to Butter dishin', to condiment dippin'- your culinary adventures reach into new domains that are far beyond what you believed possible in not just disposable dishware- but catering as a whole! 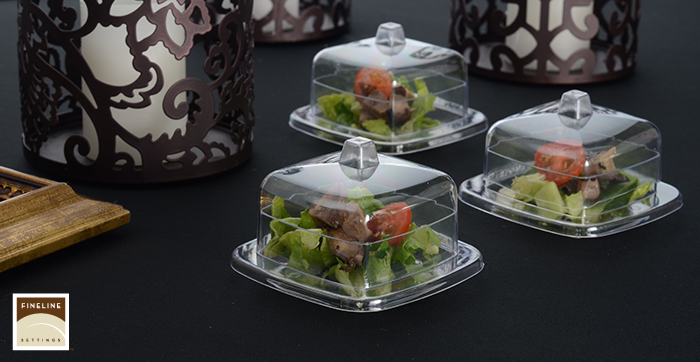 With the remarkable clarity of these little domes, no matter what you choose to serve, it will shine! Use this time of renewal and rejuvination to heighten your potential and take your celebration savvy to heights that are limitless! Take a look below to see just a handful of what makes our little domains unique! 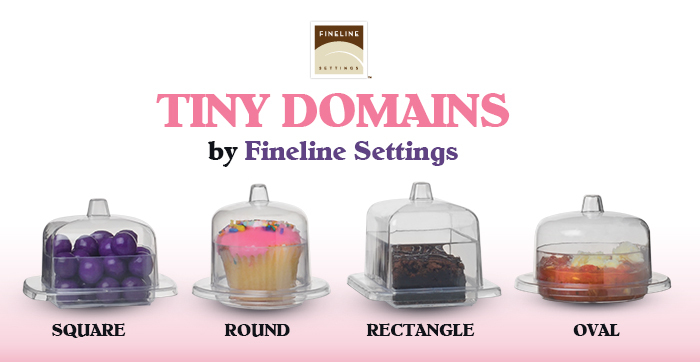 Choose from BLACK or CLEAR bases with our Round Domain! CRYSTAL CLARITY ensures every appetizer is adored from ALL ANGLES! TIGHT FIT to keep everything in its place! PAIRS PERFECTLY with all of our tiny Utensils and Trays! INCLUDES both the base and the lid with your order! IN KEEPING WITH OUR TINY TEMPTATIONS PHILOSOPHY: See with your own illustrious eyes that our Tiny Domains will help you make your BIGGEST bang, and leave an immense impression on your guests for years to come! We can’t wait to see all of the amazing things you’ll do with your newly discovered DOMAINS!